In the height of my Yu-Gi-Oh! Obsession there was one card that stood above the rest. The card I absolutely needed to own to complete my magicians deck; The Dark Magician Girl. I did eventually get this elusive card and finished off my Yugi-inspired magicians deck and now thanks to GoodSmile and Figma I have the Dark Magician Girl in action figure form next to Yugi on my shelf! It’s a great time to be a fan of Yu-Gi-Oh! 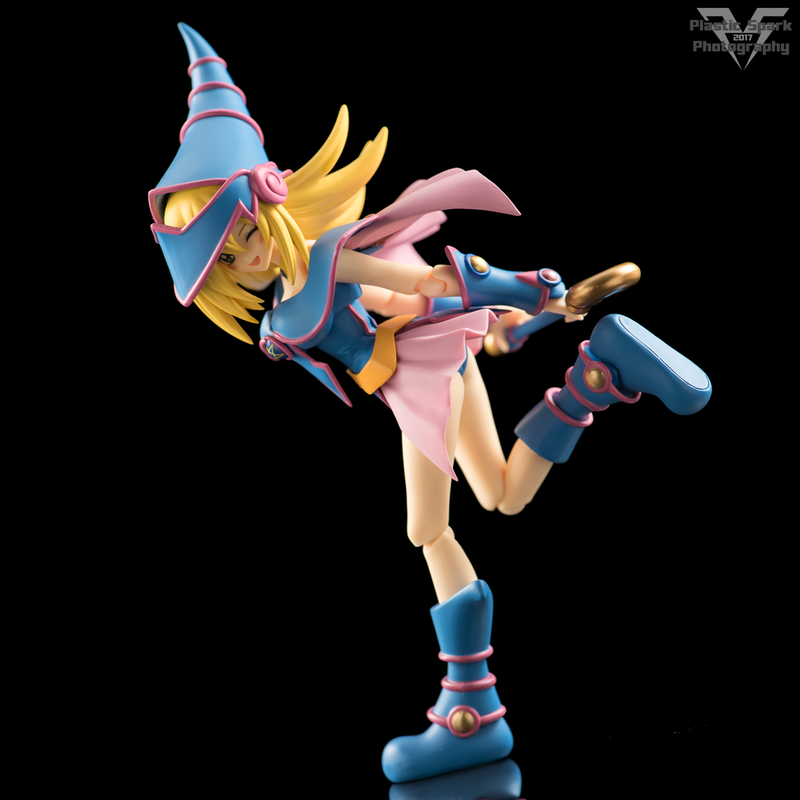 Dark Magician Girl has been expertly recreated in Figma form with this highly poseable and well detailed action figure. Her outfit and accessories are all perfectly executed and she has a variety of display options. The paint work is crisp and even the smallest details are picked out expertly. I did notice upon close examination of the photos that she has a blemish on her chest, with some scratches or scuffs in the blue paint but to the naked eye these blemishes are barely visible and easily repaired. It’s also possible I could have caused these myself with a sharp fingernail by accident while posing her. I absolutely love the face options they included as they are all so cute and the detail is very crisp. Her costume is made of a flexible material allowing it to bend slightly to accommodate almost any pose you might want to pull off. She has a standard Figma peg hole in her back to allow for flying poses as most of her appearances in the anime involved her floating or flying rather than standing on solid ground. 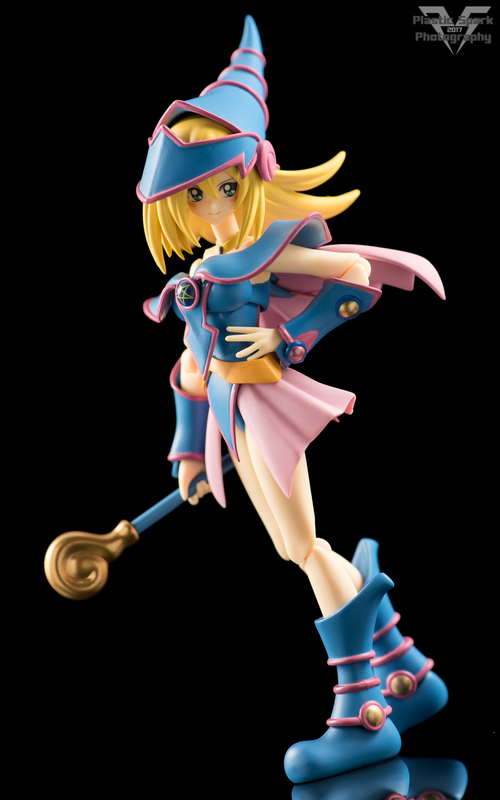 She also comes with her magic tome, and a specialized stand to allow it to float in front of her. Despite included the Figma display stand, I find she balances very well and can stand on her own in most poses. I was concerned as her feet look very rounded but they have a fairly large flat base on the bottom for great balance. For accessories she comes with her signature magic wand accessory, painted in blue and gold. 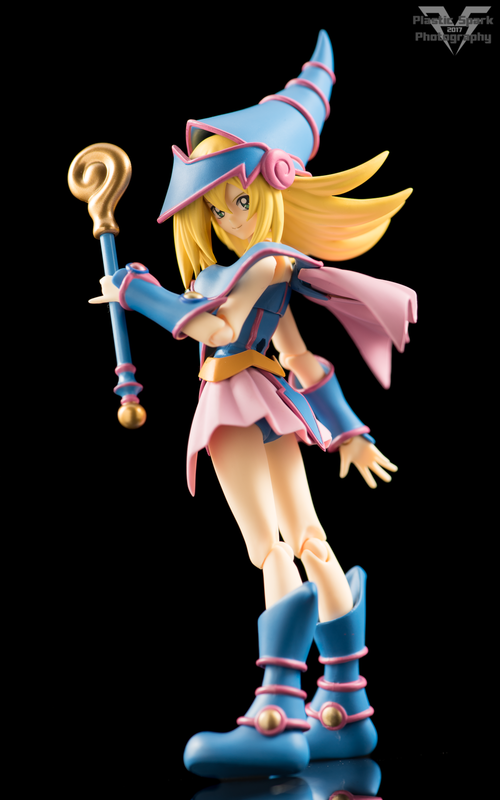 She also comes with the Magic Tome and its included display stand, as well as the usual plethora of Figma hands and face plates. She has 3 different face plates; a confident smirk, a winky smile, and a calm smile. A mad/attacking face would have been a nice inclusion as well but it’s not the end of the world. If cute could kill... I'd be 6 feet under. For replaceable hands she comes with v hands, splayed hands, fists, gripping fists, a special “cute” gripping hand with the pinky out, and a slightly relaxed hand to hold on her waist, adjust her hat with, or it even works to make it look like she is turning the pages in her tome. Her hat is also removable so you can count that as an accessory if you like however removing it does leave a large rectangular peg hole visible from the back. Her final accessory is a pair of bent legs for kneeling or posing with one leg raised. I feel like you can still achieve most of these poses with her regular legs but the removal of the knee joint allows cleaner display options. 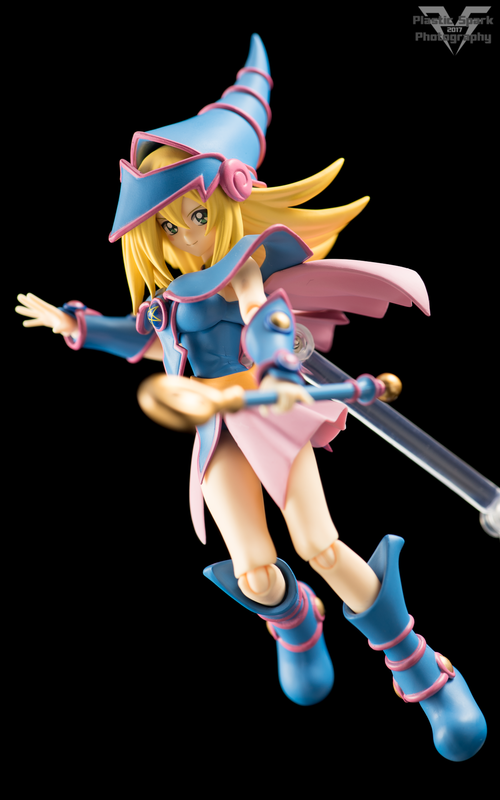 Of course she also includes the standard Figma stand and peg holder for her hands. If you ordered directly from GoodSmile she comes with a bonus attack effect. I personally think this should have been included with the retail figure but at this point no one should be surprised by GoodSmiles incentive bonuses. 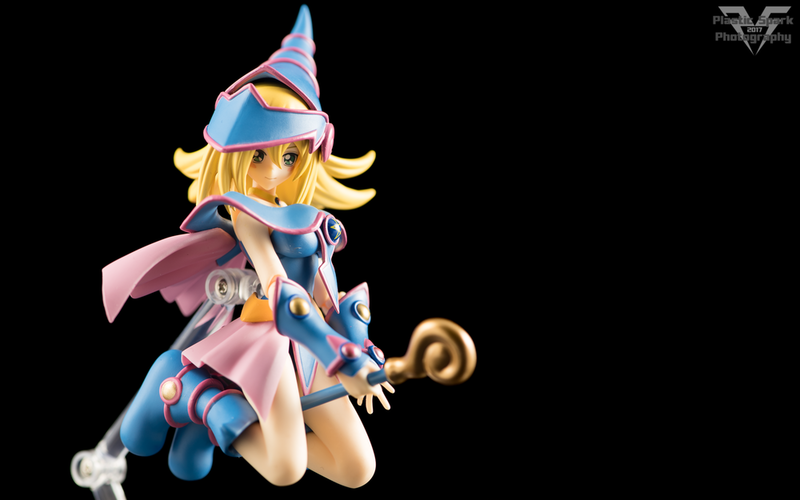 Dark Magician Girl is a super cute, well executed piece of collectible joy. For any Yu-Gi-Oh! 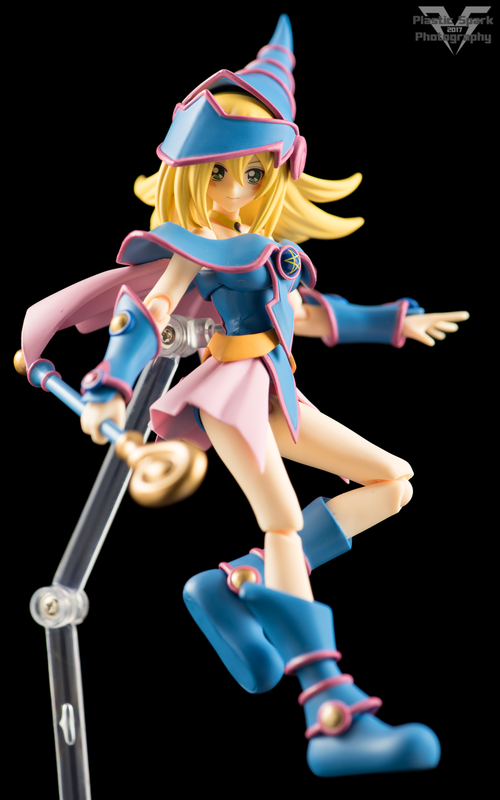 Fan out there this is definitely a recommended pick up alongside Figma Yugi. 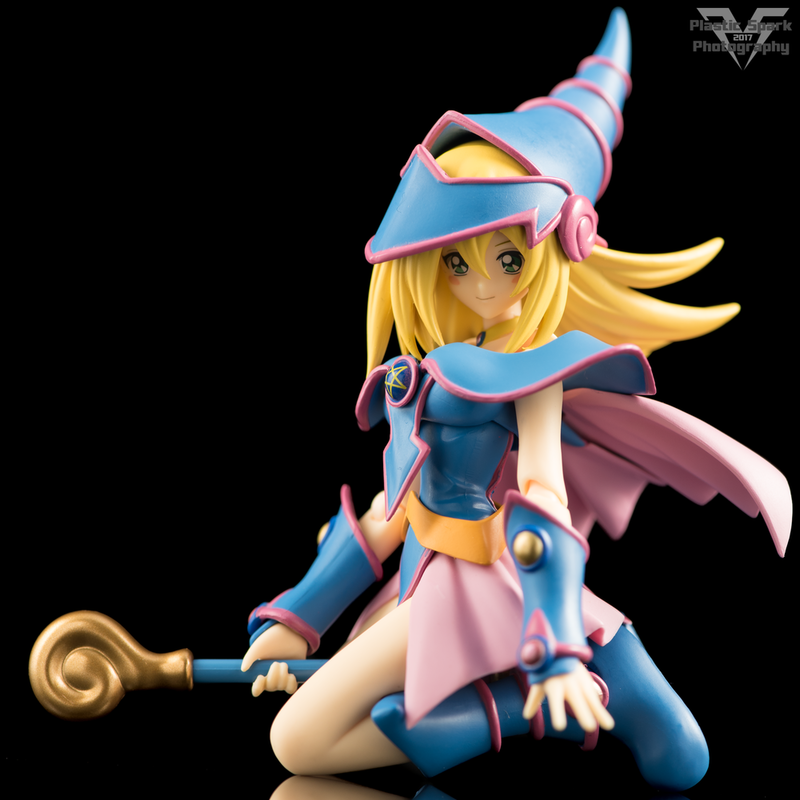 I’m really hoping we get an anime inspired Dark Magician figure now to complete this set! As usual if you have any comments, questions, or requests please let me know in the comments section or email me at PlasticSparkPhotography@gmail.com.